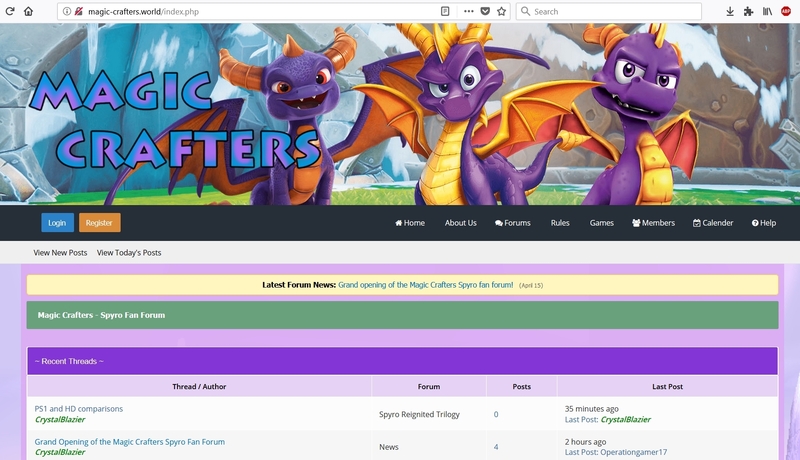 So, recently in hype of the upcoming Spyro Reignited Trilogy, I have founded a new Spyro fan forum named Magic Crafters. It's a Spyro focused forum, but has a small Skylanders section too that mainly has games and media that has Spyro being involved more prominently. Don't worry, the Skylands Academy forum will still be up for you guys, unless there are some circumstances. I'm part of the Magic Crafters find me as Kairi_In_Artisans, i'll still stick arround here. Oh, I'll have to make an account then. I like the comparison of the 3 Spyro's on the banner. Nice job! I got a funny feeling this is going to end in disaster. You can bet on stubborn retro-Spyro fans ruining the mood. I think I'll stick to around here, guys. Should I be a part of this or not? Mood seems to be pretty alright in there. I guess the more elitist fans don't want to leave their circles just yet. I'd say it's more like they don't want to mingle with the other fandoms. Just about every gamer and their dog is aware of the hazardous world that is the Spyro community. How is the Spyro Community Hazardous? Retro-fans - that's all you need. If you try to say anything remotely positive about Skylanders or The Legend of Spyro trilogy, the retro-fans become... aggressive, to put it one way. It's hard to be a pure Spyro fan (a fan of all of his series) when the retro-fans are around, because they don't even GIVE you an opportunity to justify reasons. To them, it's all about one thing: the first three Spyro games. Everything afterwards is the worst video game ever made to them. Think of it like the Sonic fanbase... only more difficult to get your opinion out. I try to avoid universal Spyro communities for THAT very reason. (04-27-2018, 07:10 PM)The Primordial Clok-Roo Wrote: Retro-fans - that's all you need.